Oh, those fancy Latin binomial plant names….Do you really need them? After all, can’t I just talk about elderberry and everyone knows what I mean, don’t they? Before I really understood these scientific plant names, I thought they may be just a little….I don’t know….overdone? But then….I had a light bulb moment…and it all happened because of elderberry. And yes. We DO absolutely need these Latin names for proper identification! And…it is very helpful to know what they mean. I was talking with a friend on the phone many, many years ago, and she was asking about red elderberry. Way back then, I just thought elderberry was simply elderberry. My dad used to take us foraging in the mountains in Southern Nevada as a young child, and I grew up thinking that what I know now is Sambucus cerulea was the only elderberry there was. That was elderberry, right? Aren’t they all the same, after all? Then I began studying botany and herbalism, and I realized….Oh. My. Gosh! These binomial names are REALLY important. For example, the red elderberry (Sambucus racemosa) is the most toxic species of elder to humans. It’s not an elderberry you want to be using, at least if you have other medicinal species of elder around. Also, not all species of elderberry have the same medicinal properties. Knowing which species of elderberry a person is talking about is vital to making good choices, especially if you are foraging. **You can find out everything you need to know about foraging & identifying elder as well as my delicious elderberry syrup recipe here, if you like. Now, I’m just using elderberry as an example. We could apply this to any single plant genus and species. Understanding the Latin names as well as proper foraging and identification techniques is vital to being a good herbalist….unless you simply want to purchase your herbs, and that’s fine too. But even if you are purchasing herbs, you still should understand exactly what you’re buying. Latin Plant Names Explained: What Do They Mean? All living things are placed in related groups so scientists can commonly refer to them the same way no matter where in the world the living thing lives. You see, using Latin binomials (genus & species) is common scientific language spoken all over the world, and there is no doubt about what plant is being referred to when you are using the scientific name. Plant classifications and organization start out with class, then moves on to order, then to family, genus, and species. When a scientist first discovers a new plant, that plant is given a special name in Latin, depending on what family it falls into, its genus, and then it's species is usually a descriptor of some kind to make it easy to differentiate between other plants in the genus. Because the plant's special name consists of two words (genus & species), it is known as a "binomial." The first name is capitalized, and the species name is not. Both are italicized and are often found in parentheses after the common name. For example, I could refer to the elderberry bush down the hill, but what does that really mean? Is it the more toxic red elderberry? Or is it the highly medicinal black elderberry? Is it the lower growing shrub? Is it a towering tree? Well, if I know its Latin name is Sambucus cerulea, then I know now that it is the blue elderberry that is native to the western part of North America and has similar medicinal qualities as the popular Sambucus nigra. You can see that the Latin binomial classification of plants saves us a lot of headaches in identification! The blue water lily: Nymphaea ceruleae (blue water lily) has the same species name as Sambucus cerulea (blue elderberry), yet they are completely different plants altogether. The genus name CAN be referred to alone, and often is when we are talking about a group of plants. For example, I could say, Rosa spp. The Rosa tells us it is the Rose family, and the "spp" tells us there are multiple species. The species name is NEVER referred to alone, because these are descriptors for a plant in a genera (plural for genus). There are all kinds of species descriptors. Let's talk about some of these common names for species. So, Rosa canina is (I'm sure you guessed) a rose. It is actually a dog rose, hence the species name "canina," like canine. And Rosa rugosa is the name of another different species of rose. Rugosa means "wrinkled" or "rough." It's kind of fun when you start understanding a little bit about Latin, which you will the longer you study your plants! 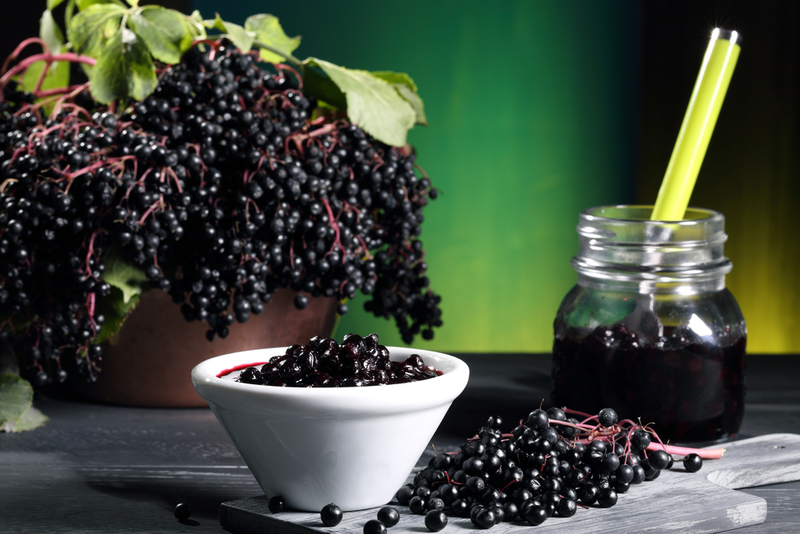 Let's talk about elderberry again. The genus for the elderberry plant is Sambucus. Here are some different species of elderberry: Sambucus nigra, Sambucus cerulea, Sambucus racemosa and there are others. Now let's look at what kind of plants these are in the same genus. Nigra means black, so Sambucus nigra is the black elderberry (really a very dark purple) we find naturally growing in the southeast United States and Europe. Sambucus cerulea is the blue elderberry (which actually has a white yeast coating on the berries, making them look blue) and grows naturally in the mountain areas of the western part of North America. This plant has very similar medicinal properties as the black elderberry. But now I want to talk about Sambucus racemosa. This is the red elderberry....and it is far more toxic to humans than other species of elder and really shouldn’t be used medicinally, in my opinion. Can you see how important the binomial system is when discussing plants? Some herbalists are very persnickety about being sure to use the Latin name all the time. Others are more casual about it. Regardless, the Latin name system is very important and nails down the exact plant you wish to identify or discuss. Plants are our friends, right? Just think about learning the Latin names as though you are learning the name of a new friend. :-) Makes it more fun! And there is one more thing I want to discuss, and this is the family name. The family name is a broader category under which the genus and species fall. Let's talk about the beautiful rose again. The rose family is Rosaceae. This family is huge, and includes shrubs, trees, and everything in between. So, Hawthorn, a wonderful tree with medicinal leaves and berries, has a genus name of Craetagus spp. But like the common rose, this tree is also in the rose family (Rosaceae). If we are talking about the common hawthorn, we would say: Craetagus monogyna; Rosaceae. This shows us the genus, species, and also at the end, the family (you may also find it at the beginning of the name as well) . Some herbalists like to include the family name for further help in identification. The Damask rose happens to be a hybrid. So you might see a little "x" in the name. This shows us it is a hybrid. It looks like this: Rosa x damascena; Rosaceae. So, now we know we are talking about the Damask Rose, in the Rose family, and that it is also a hybrid. Don't be worried about this, though. Those Latin names will start making more sense the more you get used to seeing them and perhaps even using them! Here are Sambucus nigra, the black elderberry. A similar but still different plant than Sambucus cerulea, the blue elderberry. These specifically refer to the species names, which again, are not capitalized. And by the way, you would never refer to a plant by only the species name. This is because other genera may share the same species name as a descriptor. An example of this might be the blue water lily (Nymphaea cerulea) and the blue elderberry (Sambucus cerulea). Both are blue, but they are completely different plants. Just by saying the name, cerulea, you still have no idea what plant you are referring to. All you know is that it is blue! These, of course, are just a few of the Latin names used to describe the specific species in a particular genus of plants. There are many, many others. But it’s fun to get to know these names! So, if I look at the above list, and I see that Mentha spicata is actually spearmint, doesn’t that make sense? It’s a mint with spear-shaped or spiked leaves! While its famous counterpart, Mentha piperita is actually peppermint! Two completely different mints called “Mentha,” but the species tells them apart. And here is a close up of Sambucus cerulea, the blue elderberry. If I were to rub off the white yeast coating, you’d see a very purple berry. BUT, it is still a different species than S. nigra. Did I talk you into getting to know your plants a little better? I sure hope so. It’s really wonderful to be able to see a binomial plant name, now, and know that it refers to the genus and the species. And when you also start realizing more about the families these plants fall into, identification of plants becomes a whole new world! I personally never thought I’d be excited about learning Latin….but now I am. And I’m also rather grateful for the five years I spent learning Spanish! The Latin romance language (Spanish, Italian and others) have many roots that are very similar to the Latin. Go forth and study! :-) Or, at least know the genus and species (first and last names) of the plants you love to interact with! The whole 12 part series, How to Start Using Herbs, and here is part 1: Which Herbs Should You Begin with First? And How to Source, Harvest, Dry & Store Your Herbs Properly. And there are LOTS more over on the blog! Go on over and browse around! One last thing: Have you ever thought about going to herbalism school? Well, you can! The Herbal Academy of New England has online courses for all levels and herbal interests. I’ve taken a great deal of my own herbal coursework there, and I completely recommend it! If you’ve been wanting to become a home herbalist, be in charge of your family’s natural health, use herbs for common complaints with confidence, and feel empowered by having some herbal skills at your fingertips, this course is for you! Take a look to find out everything you’ll learn and be able to do!